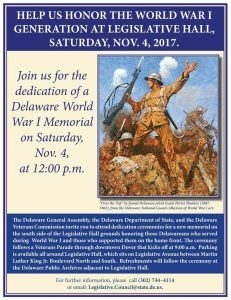 DOVER – The Delaware General Assembly, the Delaware Commission of Veterans Affairs and the Delaware Heritage Commission will unveil a new monument this weekend honoring Delawareans who served in World War I and those who supported them on the home front. The monument will be installed on the grounds of Legislative Hall and dedicated with a special ceremony at noon on Saturday, Nov. 4. Throughout the United States’ engagement in World War I, some 9,000 Delawareans served overseas in the U.S. Army, Navy and Marine Corps. Of that number, 43 Delawareans were killed in action and 188 were wounded. 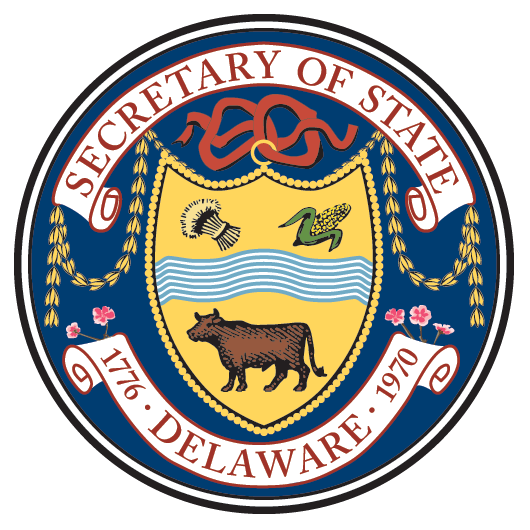 Many more succumbed to the great influenza epidemic of 1918-1919, bringing the total number of Delaware service personnel lost during the war to 270. The monument ceremony will follow a veterans’ parade through downtown Dover, featuring the First State Corvette Club, Buffalo Soldiers Motorcycle Club, cadets of the First State Military Academy, the Dover High School Band as well as local veterans’ groups. Those interested in participating may call (302) 739-2792 or email sable.vance@delaware.gov for more information. The parade will begin at the west end of Loockerman St. and progress through downtown Dover to Legislative Mall. The monument dedication will take place on the grounds of Legislative Hall, near the corner of Legislative Ave. and Martin Luther King Jr. Blvd. South.